What: When lawyer Elliot Anderson’s (Costner) wife dies in a car accident, his drinking escalates. He’s left to raise his biracial granddaughter Eloise on his own. Eloise’s African-American grandmother feels the child would benefit from being around the black side of her heritage more. A heated custody battle ensues, and it gets even hotter when Eloise’s drug addict father gets involved. What: The world of Leonardo da Vinci is brought to life by actor Peter Capaldi in a documentary. Da Vinci’s journals from around the time of the Italian Renaissance chronicle the work of one of the world’s greatest polymath geniuses. (He was a philosopher, inventor, and of course—painter.) Capaldi dramatically narrates passages from these journals and captures the passion of Leonardo’s ambition, his opinion of the world, and his views on art and life. It also captures the artist’s failures, hurts, and anger, along with mundane things like shopping lists, health tips, and jokes. What: Alice (Julianne Moore) is a cognitive psychologist with early onset Alzheimer’s disease. She struggles to manage illness, job, marriage, and family. Alec Baldwin plays her husband, and Kristen Stewart, Kate Bosworth, and Hunter Parrish play her children. What: The biblically inspired “Exodus,” directed by Ridley Scott, is the updated Moses story from Cecil B. DeMille’s two versions of “The Ten Commandments.” Moses and Rhamses are raised as brothers in ancient Egypt, with Rhamses set to inherit the kingdom. Moses would make a better heir, but word gets out that he’s really a Hebrew (the Egyptians enslaved Hebrews) and he gets cast out. In Moses’s wanderings, God begins to speak to him about becoming a leader for the Hebrew rebellion. What: If you liked “American Hustle,” you’ll probably like the sometimes funny, psychedelic 1970’s stoner surf noir “Inherent Vice.” Joaquin Phoenix is Larry Sportello, a substance-loving private eye who gets drawn into a “Chinatown”-like conspiracy involving a real-estate developer (Eric Roberts). It’s the tail end of the psychedelic ’60s, and paranoia is running high. Owen Wilson, Benicio Del Toro, Josh Brolin, and Martin Short add some spice. What: Wes Bentley plays Bill, an unemployed insurance adjuster and family man. Bill loses his job, and his nice life soon becomes a nightmare. Terrified that he’ll lose everything he worked so hard for, he turns to criminal behavior. With things rapidly getting more dangerous in order to stay ahead of the law, he fights for his family but discovers the only thing worse than getting caught is not getting caught. Jason Isaacs portrays the washed-up detective on Bill’s trail. What: This study of filmmaker Orson Welles’s life hits many highlights. His story’s been told many times, but one thing this rendering provides is a strong visual sense of the world in which he lived and worked—along with rare documentary footage drawn from diverse international sources, peeks at unfinished works, and old but relevant interviews with figures like John Houseman and Anthony Perkins. What: Having taken all their stolen stuff back from Smaug the dragon, Thorin Oakenshield (Richard Armitage) burns many bridges in his search for the Arkenstone. Meanwhile, dark lord Sauron sends loads of Orcs to the Lonely Mountain. 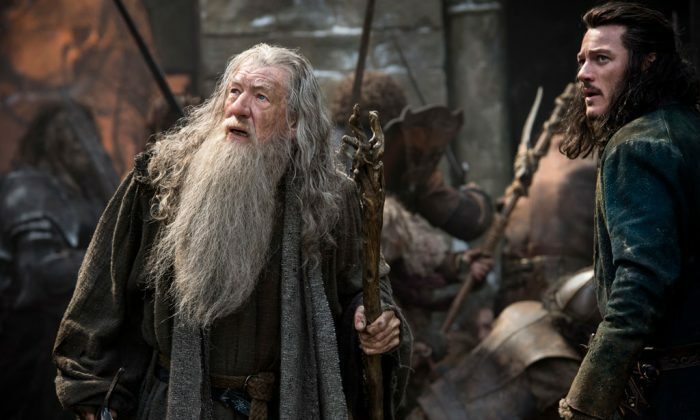 Middle Earth’s future is uncertain, and Men, Elves, and Dwarves will have to either unite or die. What: Mark Wahlberg plays Jim Bennett, a risk taker. He’s an English professor but also a high-stakes gambler. Eventually he borrows from a gangster, offering his own life as collateral and pitting this creditor against a gambling ring boss, playing both sides, and thereby attracting the attention of a loan shark (John Goodman) who likes his style. What: A film encompassing the last 25 years of renowned English painter J. M. W. Turner’s life. Devastated by the death of his father, he has an affair with his housekeeper, and lives incognito with his landlady in London’s Chelsea until his death. He travels, paints, hangs out with country aristocracy, frequents brothels, and has himself tied to a ship mast in order to paint a snowstorm. He was loved and hated by both the public and royalty. What: In this action-comedy, James Franco and Seth Rogen play a celebrity tabloid TV show host and producer whose show is called “Skylark Tonight.” When they find out North Korean dictator Kim Jong-un is a fan, they set up an interview with him in an attempt to be taken seriously as journalists. As they get ready to fly to Korea, the CIA recruits these two knuckleheads to assassinate Kim Jong-un. What: “Into the Woods” weaves the plots of several Grimm fairy tales, namely “Little Red Riding Hood,” “Jack and the Beanstalk,” “Rapunzel,” and “Cinderella,” and explores the consequences of various characters’ wishes and quests. Originally a Broadway fantasy musical, the film ends up being about responsibility, being careful what one wishes for, and the things we leave our children. What: World War II hero and former track star Louis Zamperini survives a plane crash in the Pacific, spends 47 days on a raft, and then over two and a half years in Japanese POW camps. Angelina Jolie directs. What: Clint Eastwood directs “American Sniper.” Bradley Cooper plays Chris Kyle, deadliest sniper with the highest body count in U.S. military history. A Navy SEAL, Kyle’s sent to Iraq to protect not only fellow SEALs, but also Marines and soldiers. He eventually earns the nicknames “Legend” and “Devil of Ramadi.” He serves four tours of duty in Iraq, but when he comes home, he finds that the war won’t go away. Starring: David Oyelowo, Tom Wilkinson, Tim Roth, Common, Carmen Ejogo, Oprah Winfrey, Cuba Gooding Jr.
What: “Selma” chronicles the three-month period in 1965 when Dr. Martin Luther King Jr. led a dangerous campaign to secure equal voting rights in the face of violent opposition. The epic march from Selma to Montgomery led to President Johnson’s (Tom Wilkinson) signing the Voting Rights Act of 1965, one of the most significant victories for the civil rights movement. The film stars David Oyelowo as King and Carmen Ejogo as Coretta Scott King. Harpo Productions co-produced the project. See trailers for new movies coming out August 2014, and read Epoch Times's predictions.